Camp Verde offers many lodging choices to suit many budgets. If you intend to bring your family making your visit to the Verde Valley an extended vacation consider staying at Clear Creek's RV Campground. Either way you will be just a short distance from beautiful Sedona Arizona. We are the getaway to the garden in the High Desert! Arizona Wine? Who would have thought? The Verde Valley, Arizona’s wine country is under-discovered, but the people who have been to the region and tasted the great wine it produces can attest to its excellence. The Verde Valley has similarities to some of the great wine producing regions in the world. It has the sunshine and heat to develop great fruit. The valley also has the unique rocky soils that help the vines produce fruit with great flavors and concentration. These soils and stressful growing conditions force the vines to struggle to survive. This struggle causes the vines to put their energy into developing less abundant but higher quality, more intensely flavored fruit - just the characteristics the winemaker wants to craft great wine. 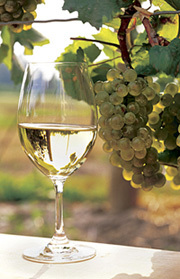 Click here to see the Verde Valley Wine Trail for information!